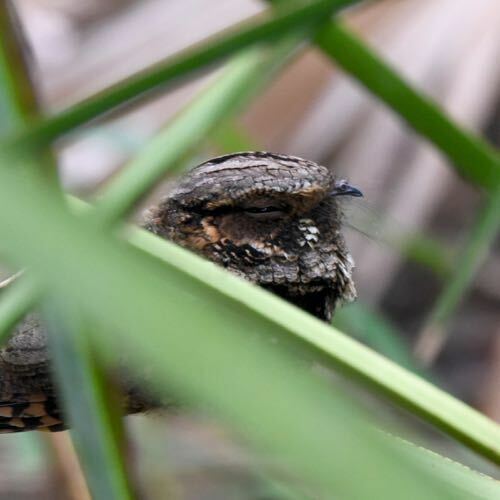 Eastern whip-poor-will, photographed at Green Cay Natural Area, Boynton Beach, Palm Beach County, in January 2019. Look carefully at that nondescript pile of leaf litter sitting in a tree. You just might be looking at this guy, the eastern whip-poor-will, Antrostomus vociferous, or one of his cousins. 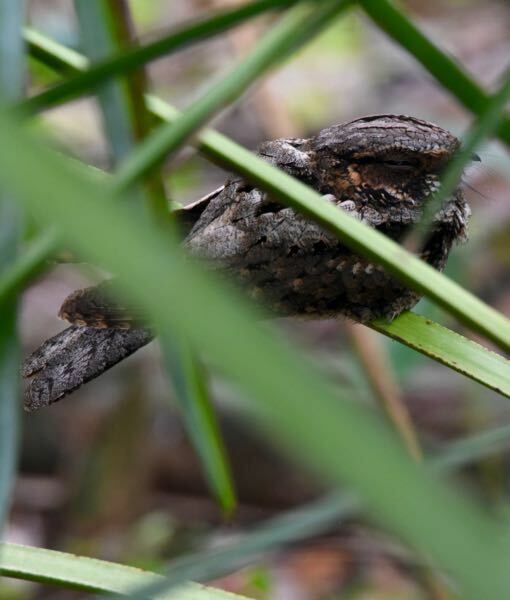 Whip-poor-wills and other nightjars are nocturnal birds, busy sweeping up bugs at night with their oversized mouths. During the day, they'll pick a spot on the ground or on a tree limb, where they'll sleep. With their large, flat heads, stout chests, closed eyes, short, thin bill and mottled plumage, they're extraordinarily difficult to spot. They are, however, quite vocal, especially during the spring and fall with their namesake whip-poor-will call, so you're likely to hear one rather than see one. Whip-poor-wills are migratory birds. They're found across most of the eastern United States and southern Canada from roughly the Great Plains to the Atlantic Coast. They'll spend summers in the northern two-thirds of their range but will retreat to Florida, Mexico and most of Central America come winter.They're found throughout Florida. Their favorite habitat: forests with open understories. Unfortunately, whip-poor-will numbers have been in steady decline since the 1960s, the reasons for which are unclear. One part of the equation is thought to be the loss of suitable habitat to development and also to fire suppression, which allows the understory to become too dense for their tastes. Because of their nocturnal habits, it's difficult to get a handle on their numbers, but despite their losses, whip-poor-wills seemingly remain common birds. All whip-poor-wills were once thought to be one species, but scientists, using DNA, discovered there were actually two, The eastern, which we see, and the Mexican whip-poor-will, which inhabitats the southwest. The two also have distinctively different calls. 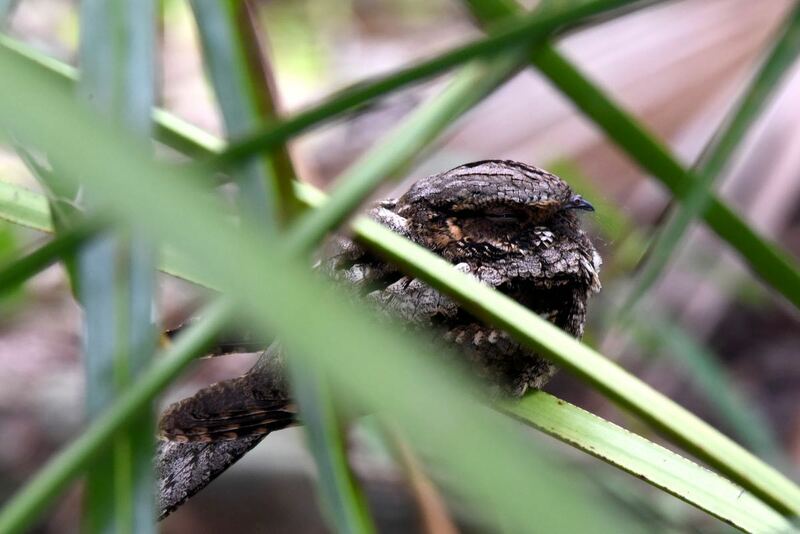 Whip-poor-wills closely resemble some of their nightjar cousins that are found in Florida during the winter — chuck-will's-widow and nighthawks. Whip-poor-wills have shorter wings relative to nighthawks; when perched, the tips of their folded wings will reach about midway on their tails. On nighthawks, the tips extend to the end of the tail. Whip-poor-wills are smaller than chuck-will's-widows, with smaller heads and shorter wings, and have white in their tails — males more prominently than females — which chuck-wills lack. They are nocturnal, rising about 30 minutes after sunset, and hunting by the remaining daylight. They'll resume at first hint of daylight, stopping about 40 minutes before sunrise. With enough moonlight, they might hunt all night. Their eyes and mouths are deceptively large allowing them to hawk for moths, beetle and mosquitoes, swallowing their catch whole. They do not build nests but rather lay their eggs in leaf litter or on bare ground. Clutches are one or two eggs; whip-poor-wills can have two broods a year. Eggs hatch after about three weeks of incubation, done by both parents. Both also feed their offspring regurgitated bugs. Young whip-poor-wills make their first flight at about 20 days. Mom might lay a second brood while dad continues to care for the first. Whip-poor-wills lay their eggs about 10 days before a full moon, giving them maximum moonlight in which to hunt in order to feed their young. Whip-poor-wills are members of Caprimulgidae, the goatsucker, or nightjar, family.